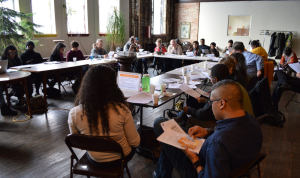 Last week the Baltimore Housing Roundtable, a coalition of affordable housing advocates, announced its plan to press Baltimore leaders to use a combination of land trusts, bonds and local hiring initiatives to develop struggling neighborhoods in the city. We look at this plan, in our continuing efforts to help find creative solutions for the troubles that challenge Baltimore. With: Peter Sabonis, Human Right to Work with Dignity Program and Co-Director for the National Economic & Social Rights Initiative; Danise Jones-Dorsey, a member of the Northeast Housing Initiative (NEHI) and Executive Director for My Brother’s Keeper, Irvington; Olivia LaVecchia, research associate with the Institute for Local Self-Reliance and its Community-Scaled Economy Initiative; and Ann Sackey of the Baltimore Housing Roundtable and the Charm City Land Trust.